There's something about most Italian restaurants that I just love. No matter what classic dish you order, it usually consists of generous portions and its pretty tough to mess up. 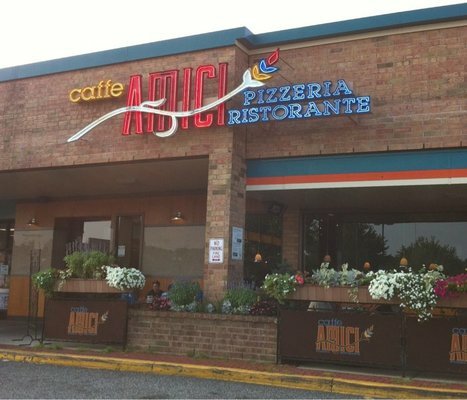 That rule stands (for the most part) for Caffe Amici. We went on a friday night and it was actually pretty packed. Having two kids, putting us in the dining room wasn't really an option so they asked if we would like to be seated in a booth by the pizzeria section. It was fine since we prefer a booth anyway! We looked over the menu and decided on some basic dishes. Mozzarella sticks, Clams Casino, Chicken Parmigiana hero and Rigatoni alla Vodka. We asked about the garlic bread with melted mozzarella but was told that garlic knots would be brought to the table anyway so we decided against ordering more bread. The knots came out nice and hot, slathered in garlic oil and loads of parmesan cheese. The clams and mozzarella sticks came out after somewhat of a wait but like I said, they were very busy. The clams were a bit on the small side and skimpy for 9.99, and unfortunately quite a few had a lot of sand in them. Thinking the problem was maybe with just one clam, we tried another and it happened again. After almost breaking a tooth a few times, we let the waitress know who at first seemed shocked and as if she didn't believe us or something but we showed her the shells with the sand. She apologized and said that has never happened before and she'd let the kitchen know. They did taste good but I'd never order them again. The mozzarella sticks on the other hand were very good. When our meals came out, everything looked and smelled great. The alla vodka had the perfect balance of tomato and cream with a subtle hint of vodka and had some extra substance because of the meat in it. The chicken parm hero was everything you'd want it to be--moist, gooey cheese and the perfect amount of sauce that the crusty bread starts to soak up. As good as everything tasted, we were stuffed (especially because of ordering extra garlic knots!) and we didn't order dessert. When the waitress brought over our check she apologized again for the clam issue and said her manager took it off the check. Throughout the night service was fine. They did the right thing with where they sat us as well as taking the clams off the check. Prices were average and if it fit into our schedule I think we would especially go back for the Monday and Tuesday night pasta special (3 courses + coffee/tea/soda for $13.99). It's definitely worth checking out!